This puller can be used to remove pressed-in brass seats from brake valves without damaging the soft metal. The seat can then be pressed back into place as needed. This tool is made using a stainless steel machine screw, a stainless steel nut, and a thick zinc-plated washer. All of the components have been proudly made right here in the USA. Use: Tap the seat using a 6-32 tap. 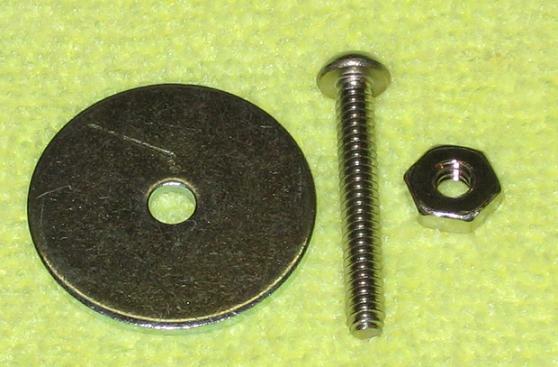 Thread the nut onto the screw to within 1/4" of the head, and then add the washer. Screw the puller into the seat and ensure that it's fully engaged. Finger-tighten the nut against the washer. Now hold the screw in position with a screwdriver and turn the nut clockwise with a 5/16" open end wrench until the seat is pulled.